There are so few of guys over my history following the game that I feel like I had a real connection with – Adam Dunn was probably at the top of that totem pole of players. Probably my favorite player of my adult life retired today. When I first got my drivers license, when Dunn was a 21-year old pup; I started driving myself two hours to games just to see him play. The first time I went to see him play he homered. When he poked his head out of the dugout that day we held a short conversation. It was meaningful to me because players at that point still seemed larger than life. It seemed like he hit about 20 home runs when I was at the park. There were the memorable Opening Day blasts. The walk-off Grand slam off Bob Wickman. The night I saw him hit one out of the stadium off John Smoltz. When I was in college I moved to Cincinnati and it was a treat because I could go to the ballpark when the Reds were home and see Dunn play. It was the summer of 2004 – and it’s what I consider to be Adam Dunn’s finest year in baseball. He hit 46 home runs that year and hit .266 with a .956 OPS. He was truly a dominating offensive presence at the age of 24 when there was little other reason to watch the Reds at night unless it was to see if Dunn dialed long distance on one. There were countless off the field stories that I heard about Dunn that made me chuckle. We were around the same age – when I was in college Dunn was carousing in his own right in Cincinnati. From all accounts I heard, Dunn as a young player seemed like a fun loving, good, genuine dude who was well liked in the clubhouse and easy to root for. The Reds were abhorrent back in those days but you knew that a brighter day sat off in the distance. You knew we were on the way up. 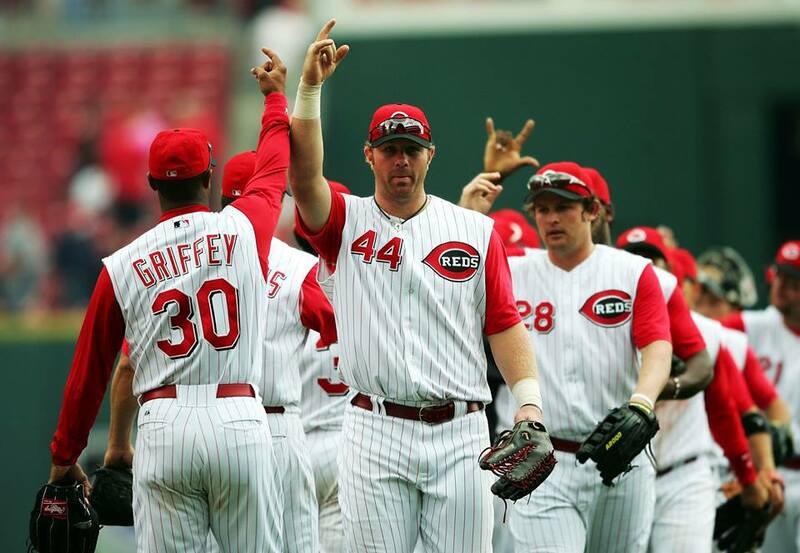 In a way; the Adam Dunn Reds era was a happier, simpler time. I have argued with friends and family members about whether or not Adam Dunn is a good ballplayer. Whether his body of work is worthy of him being considered for greatness during a period of time. It’s useless to have these arguments the same way that arguing politics with someone on the other side is. The fact of the matter is – I’ve always favored sluggers who could hit video-game style home runs and if a guy could do that, I care less about his glove. Adam Dunn was as true of a slugger as there ever was, he was the perfect player for me to fall in love with. He is hard to categorize or compare as Joe Posnanski did recently, because there is no other baseball atom just like Dunn ever before. One should stand back and appreciate his fabulous career for what it was as Jayson Stark recently did; because the fact of the matter is that Dunn was a very rare offensive weapon. Career slugging of .490, career OPS of .854, reaching a .900 OPS in six seasons and coming very close in three others. He was a three true outcomes guy, and I loved it. He usually homered, walked, or struck out. Two out of three ain’t bad. He was a tough Texan who I’m not sure ever really gave up dipping – I even saw him in with a lipper last night. A good old boy who just loved playing ball – he was chronicled in a 2002 Sports Illustrated article that displayed what a simple guy he was. I already liked what I saw from him his rookie year, but it was then I decided that Adam Dunn was my guy. I tore the article out of my magazine and taped it on my dorm room wall. This was the guy I would hang my hat on. He didn’t let me down. One thing I really appreciated about Dunn following him closely is he seemed to always be in the lineup. I recall him one 90 degree Sunday early afternoon lumbering out of the clubhouse just before gametime. He had probably been out the night before until God knows when. I sure the Hell wouldn’t have played. He dunked his head into a cold tub for a few seconds, dried his face with a towel, and then grabbed his glove. That stuck with me. Dunn was in the game a long time and took a lot of unreal pitchers deep (look at the names on this list of 462). Where there are guys who struggle against elite pitching and only shoot cripples, Dunn seemed to be just as likely to get a piece of the elite and struggle against the soft-tossing lefty. Without even looking I can tell you he dominated Roger Clemens and struggled against Oliver Perez. Baseball is so much about tying eras together. There was no player that carried me through the end of high school, all of college, into my life as a young and full adult like Dunn did. I continued to root for him when he sadly moved on to several stops. Last night when Oakland blew the lead for the third and final time and the camera panned to a long-faced Dunner; I knew that was it. I knew that my guy was never going to appear in a postseason game and that’s a damn shame. Maybe Dunn didn’t live up to everything he was supposed to be – in 2002 he hit .300 on the nose the first half of the season before he became only a pure slugger. He never would hit for much average or be a complete player. But Dunn had a great career and was a feared bat in the middle of every lineup he was in. When the big man came to the plate, you made sure you were paying attention. I think that speaks volumes about his ability. His signed baseball will sit on my bedroom shelf for as long as I live and I will hold the memories he provided me with as a player very near and dear. They’re etched and burned into a special place in my memory. Thank you for that, Adam. Your career was vastly appreciated by this guy. You made me love following the game more and I always looked for your name in the box scores (when he began his career it was the newspaper, when he ended his career it was on an iPhone). ‘Cows come and cows go, but the Big Donkey lives on forever’.